Here’s an easy, delicious, Asian inspired meal. I prefer to marinate the meat several hours or overnight for extra flavor, but it’s not required. If you need to whip up dinner in a hurry, just toss the beef in the marinade for a few minutes and continue with the recipe. Prepare the marinade in a small bowl. Combine soy sauce, sherry, cornstarch, brown sugar, ginger, chili paste, garlic and the juice of half the lime. Pour a third of the marinade into a large ziplock bag with the sliced beef and toss to coat. Marinate several hours or overnight, reserving the rest of the marinade for later. When you are ready to prepare, add one tablespoon oil to a large skillet and sauté onions for a couple of minutes over medium-high to high heat. Add the bell peppers and jalapenos. Continue to saute just until peppers are tender but still crisp. Remove and set aside. Cook Thai rice noodles according to package directions. Add the remaining tablespoon of oil to the hot skillet and add the marinated meat. Separate to evenly distribute in the pan. Cook for about 30 seconds per side. Reduce the heat to low, add the onions and peppers then pour in the remaining marinade and stir. Simmer on low heat for several minutes. Let the sauce slowly thicken. Adjust the amount of spice to your liking. I add additional chili paste for extra heat. Turn off the stove. Remove the noodles from the pot with tongs and add directly into the meat and vegetable mixture. Toss and add some pasta water if needed to thin the sauce. Garnish with fresh parsley leaves and serve immediately with a squeeze of the remaining lime half. *Note: you can substitute white wine, wine vinegar or rice wine vinegar for sherry. Use chicken broth if you do not wish to use alcohol. I prefer to use Grapeseed oil for health reasons, but you can use vegetable or olive oil. 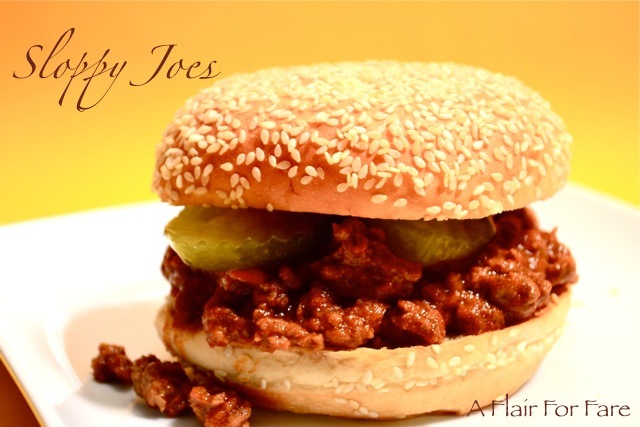 This recipe by Adam Richman was recently featured on The Today Show. 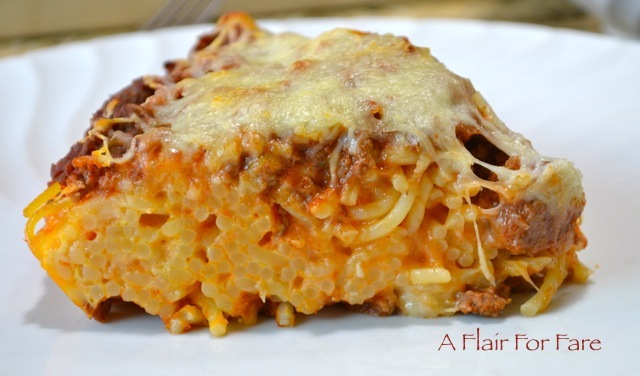 A delicious baked pasta dish that can be made ahead and baked the next day. I added green pepper and italian herb seasoning for extra flavor. Cook spaghetti following package instructions. Reserve 1/2 cup of the cooking water. Drain pasta and set aside. Add 1 tablespoon of grape seed or olive oil to a large skillet. Sauté onion and green pepper over medium heat until soft. Add ground turkey or beef and cook until no longer pink. Add 3/4 cup tomato paste, pasta water and italian seasoning. Simmer over low heat until sauce thickens. Add salt and pepper to taste. Mix spaghetti, eggs, parmesan, 1 cup mozzarella and remaining 1/4 cup of tomato paste in a large bowl. Spray a 9 inch pie plate with Pam or coat with olive oil. Spread 1/2 of the meat sauce in the bottom of the pie plate. Add spaghetti mixture, pressing down. Spread remaining sauce on top then sprinkle with 1/2 cup shredded mozzarella. Bake for 30 to 35 minutes. Remove from the oven and let sit about 10 minutes. Use a sharp knife to slice into wedges. Top wit additional grated parmesan, if desired. Serve with a green salad and hot crusty bread. Serves 6. 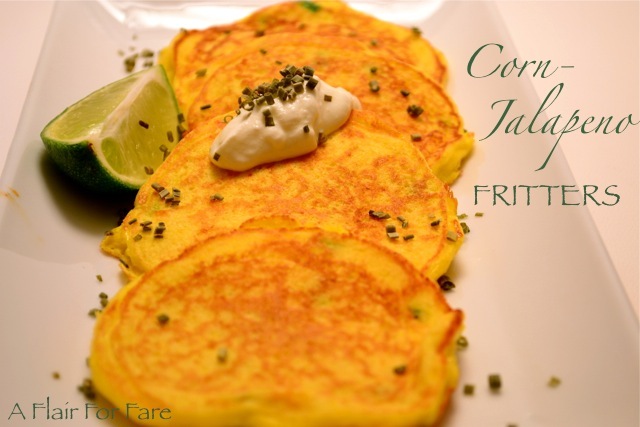 These spicy little corn cakes are a delicious alternative to potato pancakes as a pork-chop side. Using a food processor, combine eggs, flour, parmesan and kosher salt. Pulse until combined. Add corn, scallion and jalapeño. Pulse 2-3 more times. Heat oil in a large heavy bottomed non-stick skillet or griddle. Pour batter onto hot pan, about 2 tablespoons per fritter. Cook for 3-4 minutes per side over medium heat, until golden. Serve with a dollop of sour cream and fresh lime wedges. This is not your everyday chicken stew. 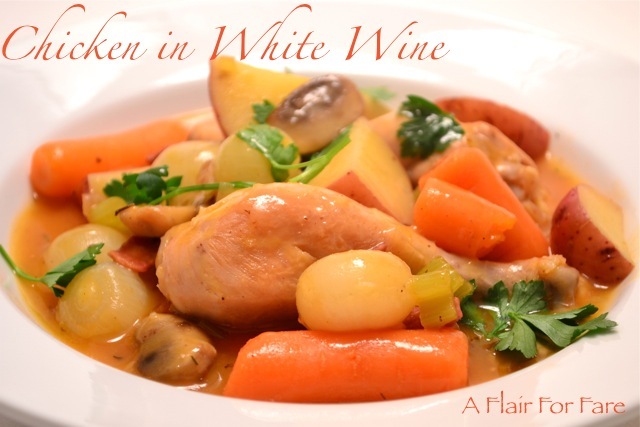 Tender, succulent chicken and hearty root vegetables bathed in a savory white wine sauce with just a hint of tomato flavor. Comforting, warm and satisfying. Add a side salad and crusty hot rolls for the perfect Sunday dinner. If you have a non-stick Dutch oven, you can cook everything in one pot. Otherwise, cook bacon and chicken in a skillet and prepare the rest in a soup pot. Over medium high heat, add chicken in several batches and cook until lightly browned. Set cooked chicken aside. In a small bowl, whisk flour and water together to make a slurry. Stir in 1/4 cup of the hot stew liquid. Pour into pot and stir in well. Cook for a few minutes until stew bubbles and thickens. Serve with chopped fresh parsley. Tip: Buy tomato paste in a tube to eliminate waste. If you don’t drink dry wine, purchase the small, individual serving size bottles for cooking. 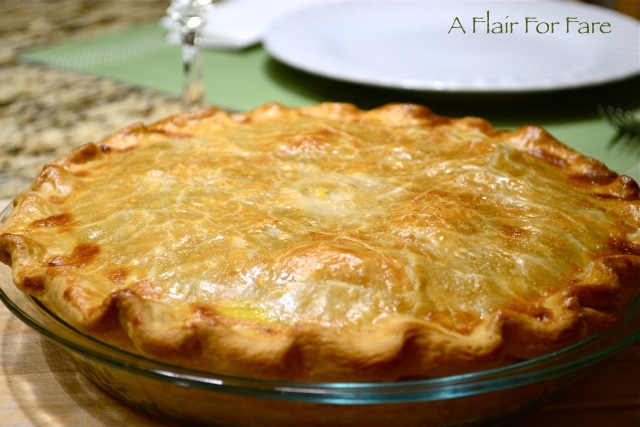 Last January I posted a version of this recipe made with puff pastry. While that has a more impressive presentation, it is a bit more work, so I thought I would re-post the recipe using packaged pie crust. Just un- roll and fill! This makes your life a little easier, and the outcome is every bit as delicious. Start by roasting the chicken. I find this method to produce a more flavorful, and moist chicken breast than boiling. Take one large chicken breast, (bone in and skin on), place it on a foil lined sheet pan. Brush the chicken with olive oil, and season with salt and pepper and Herbs de Provence. Roast in a 350 degree oven for about 45 minutes, until the skin is crisp and lightly browned. Roasting time can vary, use a instant read thermometer if you are unsure. The chicken should be cooked to an internal temperature of 165 degrees, which is a safe minimum internal cooking temperature according to food safety.gov. You can also use leftovers from a rotisserie chicken. Let the chicken rest until cool enough to handle. Remove skin and shred or cut into bite size pieces. Cook the potato. You can bake in the oven or microwave just until tender, but still firm. Cool and dice. Preheat the oven to 425 degrees. Remove prepared pic crust from refrigerator. In a medium saucepan, melt the butter over medium heat. Add onion; cook until tender, about 2 minutes. Stir in flour, salt and pepper. Cook stirring constantly for about 3 minutes until the flour mixture is bubbly. Stir in the broth and milk. Heat until bubbly, stirring constantly. Stir in chicken and vegetables until heated through. Make an egg wash. Crack one egg into a bowl and add a teaspoon of water. Beat egg and water. Carefully un-roll one of the pie crusts. Place in a 9 inch pie plate. Spoon the prepared filling into the crust. Un-roll the second crust and carefully place the second crust on top and flute the edge. Cut 4 slits in the top. Brush the crust with the egg wash. Place pie plate on a sheet pan and move to pre heated oven. Bake for 35 to 40 minutes at 425 until crust is golden brown. Check after 20 minutes. 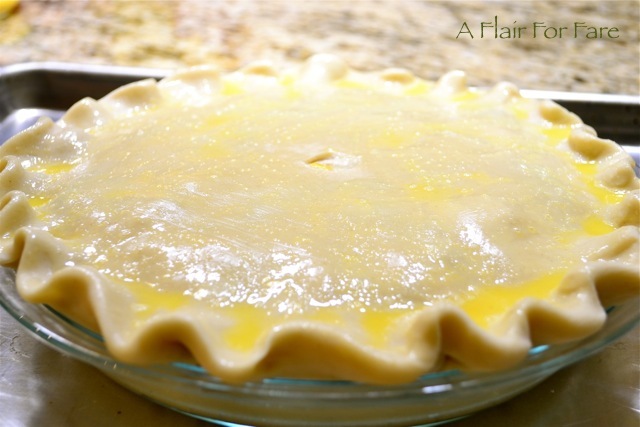 If browning quickly, place a sheet of foil loosely over the pie and continue to bake. This will prevent over-browning. Remove from oven and let rest for 10 minutes before cutting. 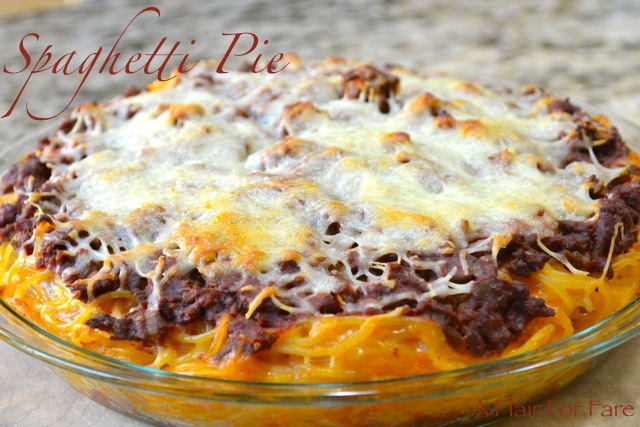 This family favorite comes together quickly for an easy weeknight meal. The perfect choice for feeding a crowd; just double or triple the recipe. Save time by making ahead and freezing for later. I like to give this sweet and tangy sauce a little kick by adding Chipotle pepper sauce. Add onion, celery, green pepper and canola oil to a large skillet or sauté pan. Cook over medium heat for about 5 minutes, until the onions are soft. Increase the heat to medium high and add the ground sirloin. Break up the beef and cook until no longer pink. Remove any fat from the pan. Stir in remaining ingredients and simmer over medium-low heat, stirring often for about 20 minutes. Serve over toasted sesame-seed buns with zesty sweet pickles, if desired. Serves 6. My garden is still producing beautiful, plump, sweet cherry tomatoes and this was the perfect dish to showcase them in. 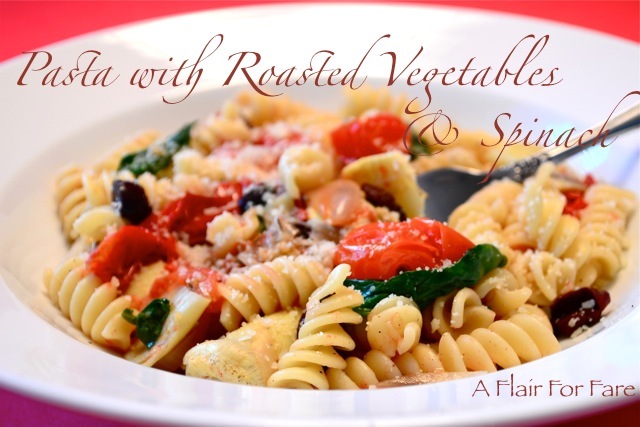 Roasting the vegetables lends incredible flavor to this light, healthy recipe. This is fabulous meal that takes little effort. Spread tomatoes, garlic, shallots and thyme on a rimmed sheet pan and toss with olive oil, salt and pepper. Roast in a preheated 450 degree oven for 20 to 25 minutes or until garlic is soft and tomatoes have burst. Cook pasta according to package directions for al dente. Reserve 1/4 cup pasta water. Drain pasta and return to pot. Peel roasted garlic and mash into a paste. Add pasta water, roasted vegetables and olives to pasta. Simmer over medium high heat 3-5 minutes until sauce thickens. Toss in spinach. Serve with freshly grated parmesan if desired. Makes 4 servings. It’s that time of year when gardens are overflowing with squash and everyone is wondering just how much zucchini bread they can make and share with friends and neighbors. Now, I love a good zucchini bread but there are lots of other ways to use summer squash. We are having a perfect summer day here and we’ll be grilling up some pork chops for dinner. 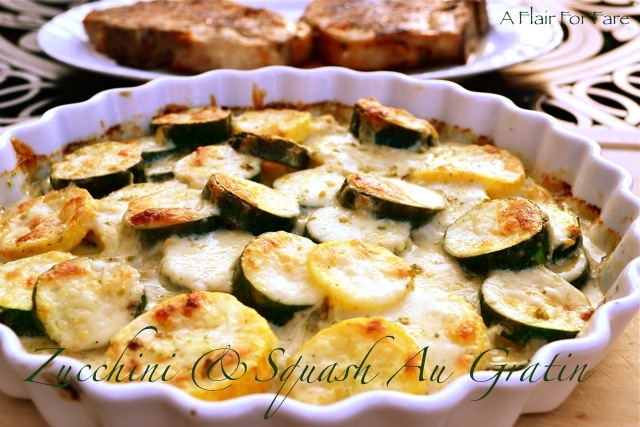 This gratin recipe that I recently pinned sounded like the perfect side for my chops so I decided to give it a whirl. The directions were somewhat vague; it gave no specific amounts for cheese or the size of baking dish, so I have included the amounts I used. The original recipe calls for a sprinkling of oregano but I used Penzey’s Fox Point seasoning which is a combination of salt and freeze dried shallots, chives, garlic, onion and green peppercorns. If you have access to this seasoning, give it a try. I use it on all of my sautéed vegetables and in eggs. It is available online if you don’t have a store nearby. Melt butter in a large skillet. Sauté shallots and garlic over medium heat until softened; 3-5 minutes. Add sliced squash; salt and pepper to taste. Sauté for 1 minute. Add cream and 3 tablespoons grated parmesan. Cook just until squash is barely fork tender; 5-7 minutes. Transfer to a baking dish ( I used an 8 inch round baking dish). Sprinkle with 1/2 cup parmesan and 1/2 cup shredded mozzarella. Bake for 15-20 minutes until bubbly and golden brown. I was pleasantly surprised to find ripe tomatoes in my garden this week. We have such a late planting season here in the Midwest, especially this year when winter just refused to die. I don’t usually have ripe tomatoes until mid to late August. I so look forward to fresh garden tomatoes every summer and all of wonderful recipes that call for them. 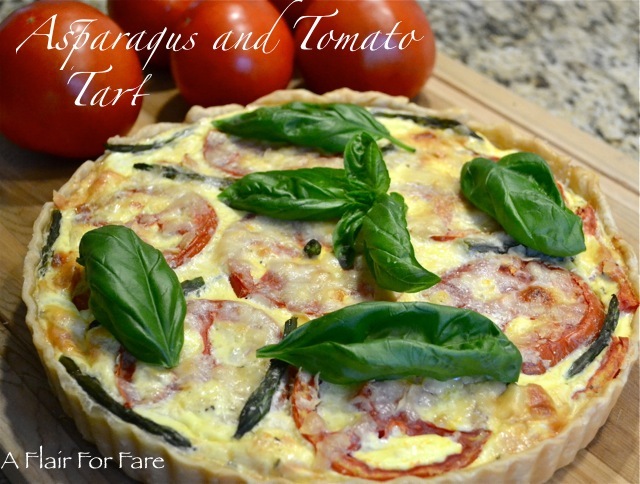 This savory tart is one of my favorites and a great way to use those delicious jewels from the garden. 1/2 pound asparagus, tough ends trimmed. 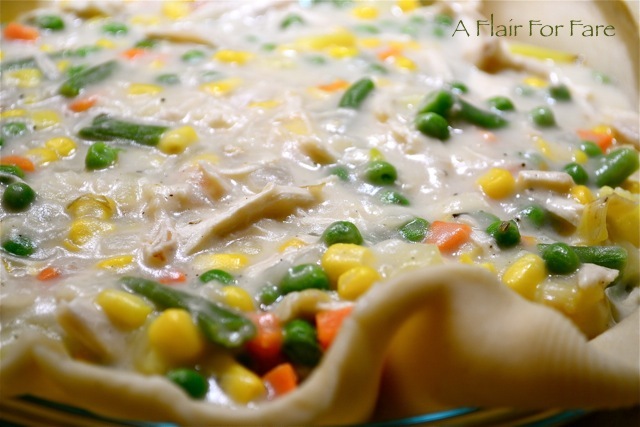 Press dough into a 9-inch deep-dish tart pan coated with cooking spray. Spread fontina cheese, olives and shallots evenly over bottom of crust. Arrange tomatoes slices and asparagus on top. Mix cornmeal, flour and thyme with salt and pepper and sprinkle over tomatoes and asparagus. Whisk eggs and milk and pour into pan. Top with Parmesan cheese. Bake at 350 degrees for 40 minutes or until set. Remove from oven and cool for 10 minutes. Add fresh basil on top, cut and serve. 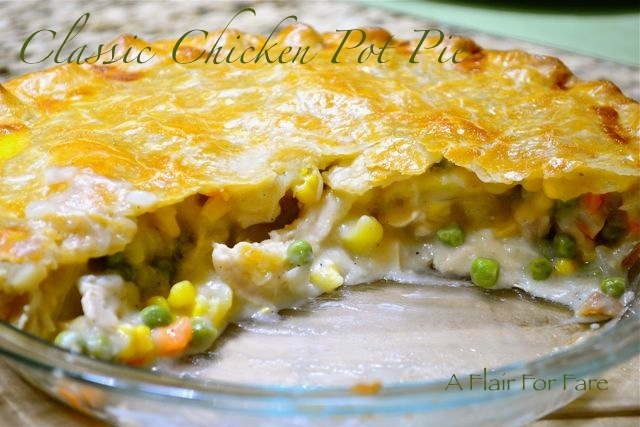 A great find from Pinterest, this is a fabulous warm side for chicken or pork. The parmesan gives it a buttery silkiness, and the sun dried tomatoes impart a tart, yet sweet flavor. It’s quick and easy too! Heat olive oil in a medium sized saucepan over medium low heat. Add red pepper flakes and heat through for about 30 seconds. Add the orzo and sauté , stirring constantly until lightly toasted; 2 minutes. Add onion or shallots and sauté until soft, another 2 minutes or so. Add minced garlic and stir for a minute. Add vegetable stock, adjust heat to high until it starts to bubble. Turn down to low heat, cover and cook for about 10 minutes, until liquid is gone and orzo is cooked through. 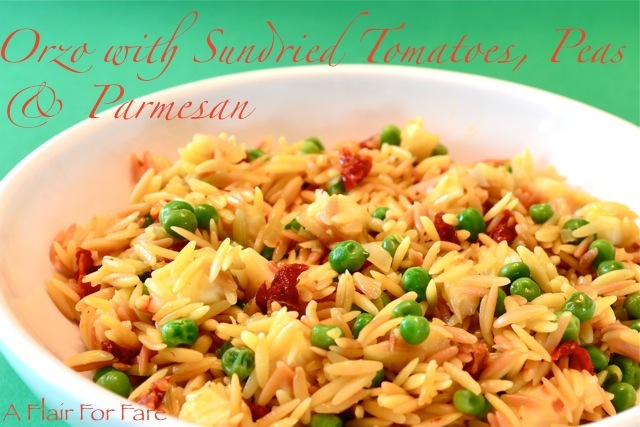 Remove from heat, fluff with fork and add sun dried tomatoes and peas, salt and pepper. Add parmesan just before serving. This dish may sound and look intimidating, but it is really quick and easy enough to serve during the week. 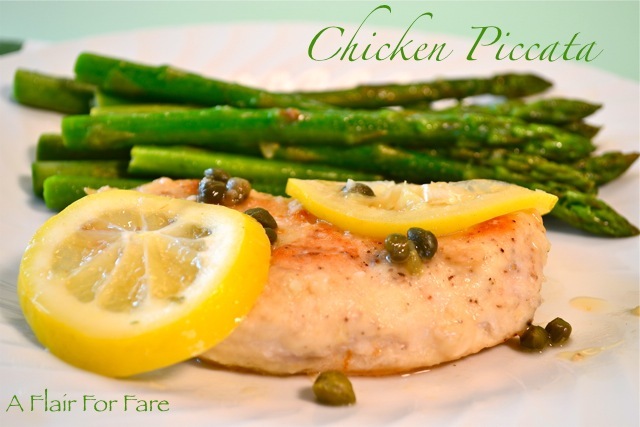 The chicken is moist and tender; the lemon butter sauce adds amazing flavor. Be sure you use a good drinking wine- never a cooking wine. Fresh lemon juice is a must as well. Slice chicken breasts in half to form 4 cutlets. Season with salt and pepper, then dredge in flour. Add oil to a medium size saucepan over medium-high heat. Saute cutlets 2-3 minutes per side until lightly browned. Remove cutlets; set aside, keep warm. Add wine to pan to deglaze. Add minced garlic and cook 2 minutes until starting to brown. Add broth, lemon juice, capers, butter and lemons. Return cutlets to pan and simmer for 3 minutes. Serve with your favorite green vegetable. I watch reruns of Pioneer Woman every day while I’m on the treadmill. That may sound strange to workout while watching food being prepared in cast iron skillets usually full of butter, but I guess I feel as if I’m burning the calories I imagine I’m consuming. 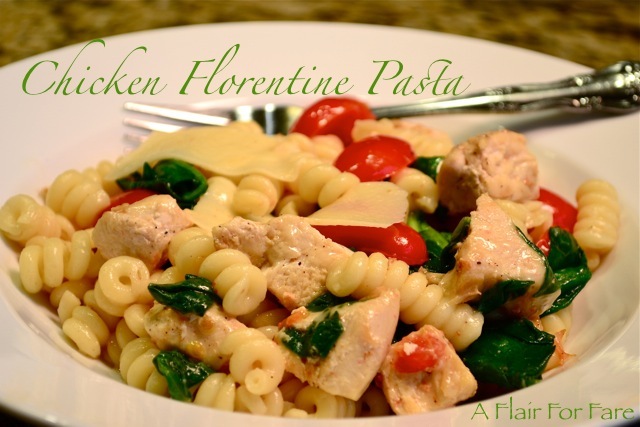 This delicious pasta dish is adapted from one of Ree’s recipes and it only contains 2 tablespoons of butter, which you could leave out, but it does lend to the flavor and browning of the chicken. Cut up chicken breasts into bite size pieces and season with salt and pepper. Add butter and olive oil to a large skillet over medium high heat. Add chicken and sauté until fully cooked and brown. Remove and set aside. Lower heat to medium, add minced garlic and another pat of butter. Cook for just a minute being careful not to burn. Add wine and chicken broth; scrape to deglaze pan. Simmer wine and broth for 5 minutes. Add cooked pasta, tomatoes and spinach and toss well. Spinach will wilt as you toss. Add parmesan cheese and toss until well combined. Serve with additional parmesan if desired. Makes 4 large servings. 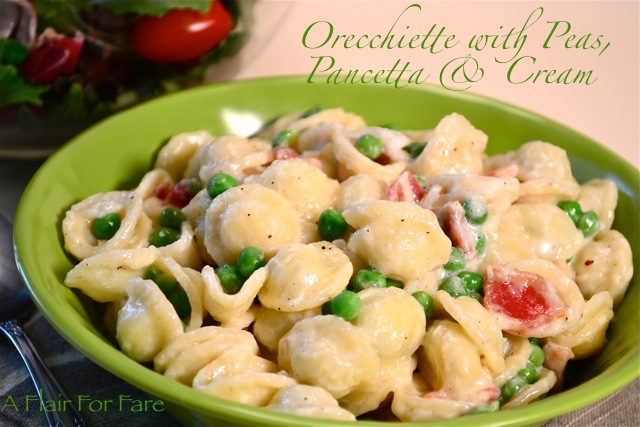 Orecchiette is the perfect shape pasta to hold the rich, cheesy cream sauce and tender green peas of this delectable dish. Serve with a side salad and warm crusty bread. Cook pasta according to package directions. Drain pasta, reserving 1/4 cup of pasta water. Add olive oil to a large sauté pan over medium heat. Add the pancetta and cook until golden brown. Remove and set aside. Remove all but 1 teaspoon of the drippings. Add butter and onions to the pan and sauté until translucent. Add minced garlic and cook for one minute. Stir in the pancetta and cream; bring to a low simmer and cook 5 minutes until slightly thickened. Pour the cooked pasta into the pancetta and cream, mixing well to coat. Add the peas and cheese. Add 1/4 cup pasta water and toss well. Add salt and pepper to taste. Serve with additional grated cheese. Serves 6.